Are you an event planner or venue looking for a bike parking solution? Our valet bike parking service is a short-term bike parking solution for venues, community events and festivals in Hobart. 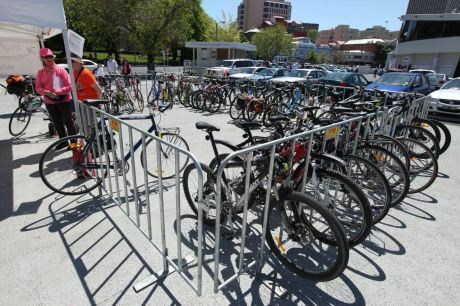 Run by the Bicycle Network Tasmania committee, valet bike parking provides a hassle-free experience for people who ride. For a small fee worn by the venue or event organiser, the service runs like a coat-check. Visitors check in and park their bikes for free while they enjoy the event knowing that their bikes are being looked after. AFL games, cricket matches, Mona Foma and the TASTE of Tasmania are just some of the venues and events that have used our valet bike parking service. For pricing and to discuss your bike parking needs, please contact us at vpc@biketas.org.au. Do I need bike parking at my venue/event? Adequate and secure bike parking is incredibly important for events and venues. Not only is a service like valet bike parking highly valued by people who ride bikes, it also offers plenty of benefits for events. Bike parking helps cut down congestion around car parking, reduces stress on traffic management, reduces security costs and helps increase your event’s ‘green’ profile. It’s also an effective community engagement tool. Most importantly, valet bike parking also helps fill the gaps left due to inadequate permanent bike parking.